The Blasphemer is an interesting novel that weaves together the stories of several men from different generations of the same family. As you might expect this is a well-constructed novel, with clearly drawn characters and interesting narrative style delivered through the switches from one time period (and life) to another. The author employs beautiful imagery in his detailed descriptions, which really build depth into the world surrounding each of the men. However, as interesting as I found the book I did not engage with all of the characters – despite them each going through a life-altering experience during your time with them, which pulled you into their lives in an absolute and intrinsically personal way. What I enjoyed most about The Blasphemer was the questions it raised and asked me to consider. The last line of the book blurb asks “How will any of us behave when we are pushed to extremes?” and this was definitely the focus of my interest in the novel. Perhaps because I write myself I have some bias towards examining human behaviour – wondering how people behave and why in given situations, so that I can write characters of my own. What is done well in the book is neutrality – the experiences, actions and emotional responses of each character are delivered without judgement, although you the reader are free to add whatever you wish…as the blurb points out, when (one of the main characters, Daniel) pushes his wife out of the way so that he can escape a plane crash, we judge him for this reflex, natural survivalist action. 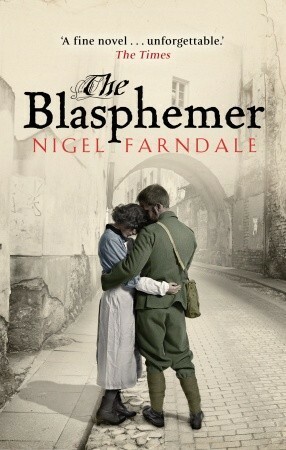 The Blasphemer dissects the characters and their relationships – it makes you question whether you can be truly loved by someone, if they do not – in the most dire of circumstances – put your life before theirs. It also examines the different types of relationship that exist between friends, lovers and families. It is interesting and thought-provoking and definitely worth a look. This entry was posted in Reviews and tagged difficult characters, examining love, human behaviour, Nigel Farndale, The Blasphemer. Bookmark the permalink.